When the weather is bad outside but you've got a big test and the library is on the other side of campus, don't settle for your uncomfortable dorm desk chair -- get yourself comfortable for a long study session right ontop of your Twin XL bed with our Dorm Bedrest Textured Comfort in Almond! Made for comfortable lounging on the weekend, marathon watching TV shows and movies, or studying for hours before major tests on your Twin XL bed -- our super plush Dorm Bedrest pillow is designed to give you comfortable back support and extreme comfort! 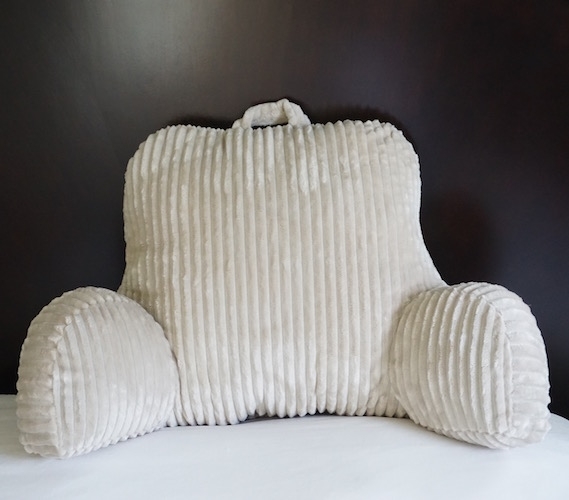 A true Full-Sized Bedrest, your Dorm Bedrest Pillow is 15" tall, 8" tall, with 15" between arms and a length of 28" when including both arms -- more than ample for elbow rests and comfortable support when using our Drom bedrest pillow! Even more than a great size, our college Dorm Bedrest pillow is stuffed to the maximum capacity with no gaps in stuffing in the arms or joints so you have the plush comfort and support you expect from functional dorm bedding bedrest pillows. Great for studying or just relaxing, don't forget to add our must-have bedding to your college dorm room!